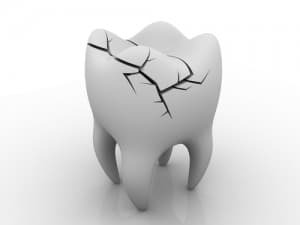 A cracked tooth may turn into a larger problem if not treated quickly. Our tooth enamel is the hardest substance in our body (even harder than our bones) and is designed to endure considerable wear and tear. However, over time, if your tooth enamel is exposed to stresses such as grinding, clenching and chewing hard objects, your enamel will eventually start to break down, leaving you with cracks and porous teeth. The most common cause of a cracked tooth is old amalgam fillings. These amalgam fillings slowly expand over time, causing fractures in the process. If you have this type of filling, it is a good idea to replace them every 15 years. Intermittent pain, which can be either slight or severe. A temporary metal band may ben placed around your tooth to hold it together, allowing us to determine symptoms and the best possible treatment further over the coming days. Nerve damage, and even the death of your nerve can occur. An abscess might even form underneath your tooth. If this occurs, we can treat the area with root canal treatment. In very serious cases, your tooth can actually split in two. If this occurs, unfortunately, we will not be able to save your tooth. It will need to be extracted. Avoid hard and crunchy foods like nuts, unpopped corn and hard lollies. Don’t chew on hard objects like pens and pencils. Avoid using your teeth to perform tasks like cracking nuts and opening packaging. Make sure you wear a mouthguard if you play contact sport.